EX Halo/Cod Developers Making A New… Action RPG? Have you heard of Certain Affinity? You haven’t? Oh… well that’s because they aren’t the actual guys behind Halo or Call of Duty, but rather some of the guys who get brought in to create map packs. Well, instead of creating a game about shooting… or maps for that matter… they have announced a brand new co-operative action RPG called Crimson Alliance. Fans of Diablo and Torchlight may really want to take a peek at this. Screenshot and some details after the jump. That actually sounds pretty awesome, and as a fan of action RPGs, I really hope that they nail it and we get a great game. The game will feature five classes and as mentioned before, will allow for co-operative play. The good news is that the game will be shown off at E3 next week and will be released on Xbox LIVE Arcade. There is no information on whether or not there are any plans to port the game to any other platforms. AUSTIN, Texas – May 31, 2011 – Gamers looking for a multiplayer title with tons of furious action and cooperative play will find it this summer on XBLA. Certain Affinity’s Crimson Alliance will mix fast-paced cooperative action combat with the rewarding element of RPG character development, in a battle against the sinister Cult of the Soul Siren. Players can choose from three classes each with a host of unique abilities ranging from the Assassin’s time-bending attacks to the Wizard’s elemental mastery to the Mercenary’s sweeping whirlwind strikes. Each class has five special abilities that can be upgraded by collecting treasure and finding hidden Soul Anchors that harbor the spirits of long dead heroes. By choosing to specialize in certain abilities, players customize characters to suit their play style and complement their friends’ characters. Partying with up to three friends on a single Xbox 360 console or over Xbox Live, players can create chain attacks that combine their different abilities for devastating effects. Different class compositions in parties allow for a diverse and unexpected set of combos. Certain Affinity’s president tasked the development team to take everything they learned from their FPS work on Call of Duty and Halo â€” strong action gameplay, addictive character progression and great encounters and environments â€” and apply it to the action RPG genre. 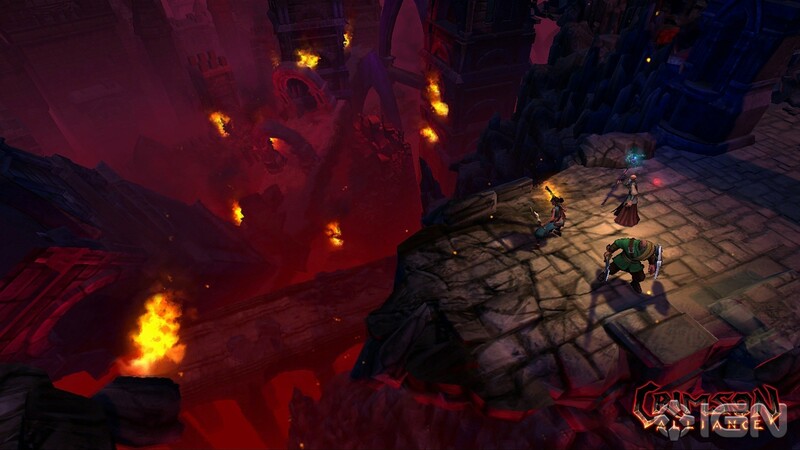 The world of Crimson features labyrinthine crypts, ruined cities, deadly traps and hidden treasures, populated by elite mini-bosses and the devious minions they control. Each of the three main characters has their own motivations, revealed in a story-driven cooperative campaign of betrayal, foul magic and ancient secrets. The game will be playable at the Microsoft booth at E3 Expo this June 7 – 9 and will be published by Microsoft Game Studios on Xbox LIVE this summer.